The new benchmark in bolt-action rifle design. The bolt-action rifle is forever changed with the introduction of the all new Browning X-Bolt. The X-Bolt builds on the proven successes of past Browning rifles, and adds numerous improvements that are certain to place the X-Bolt at the top of the pack. Most notably is a completely new adjustable three-lever Feather Trigger™ system that offers the best feel on any Browning rifle ever. A new bolt unlock button works with the top-tang safety to offer enhanced safety while unloading. New styling features more compact dimensions for a smaller, quicker, sleeker look and feel, and also trims weight. To ensure the stability of optics, scope bases are attached to the receiver using four screws per base. 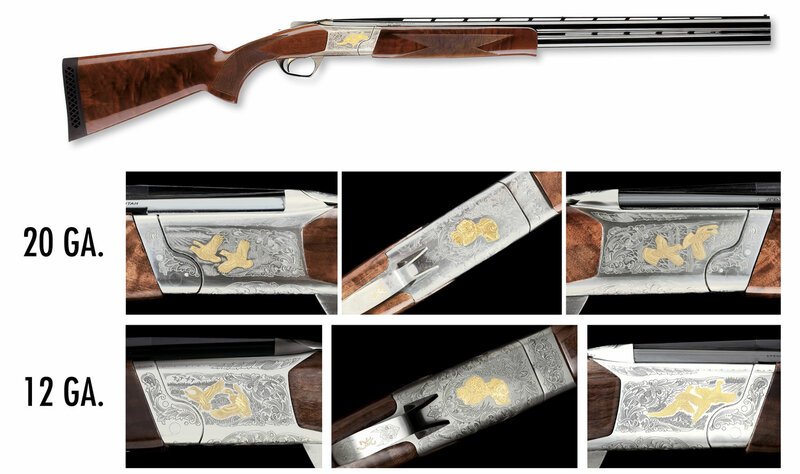 Innovation is the Browning tradition, and the X-Bolt is just the latest example. Click on the image at right for interactive content on every X-Bolt feature. Click below for the new X-Bolt 30 second commercial.X-Bolt Feather Trigger™ For precise shooting in the field or off the bench, there's absolutely no substitute for a good, predictable trigger. The X-Bolt's new three-lever Feather Trigger provides a clean, crisp pull with no take-up or creep and minimal overtravel. The trigger is screw adjustable from 3 to 5 lbs. and factory pre-set at approximately 3 1/2 lbs. An alloy trigger housing contains the hard chromed steel components that are highly polished on all critical contact surfaces. Precise engagement angles mean the X-Bolt Feather Trigger feels light and right and stays that way through many thousands of rounds. Unlike competitors' triggers with secondary fingerpiece levers, the Feather Trigger is designed right, from the very start. X-Lock™ Scope Mounting System Securely mounted optics are essential for accuracy and precision on any rifle. To ensure the new X-Bolt has the most stable scope mounting system possible, the X-Lock mounts feature an all new four screw per base design that replaces the traditional two screw system. The benefits are obvious, with the bases being secured at all four corners, rather than only attached at the center of the base for more accurate placement on the receiver. Bolt Unlock Button The bolt unlock button works in conjunction with the top-tang safety to provide an added measure of safety during checking and unloading of the chamber. Conveniently located on top of the bolt lever, the bolt unlock button allows the bolt to be unlocked and opened with the safety in the on safe position. The safety blocks the trigger sear and features a firing pin block for added safety.60° Bolt Lift Short 60° bolt lift is fast cycling and allows you to work the bolt quickly without the scope getting in the way. The all new bolt is machined from a block of solid steel bar stock for strength and custom rifle precision. Three locking lugs provide exceptional bolt strength. Barrel A free-floating barrel is essential for utmost accuracy. The X-Bolt is free-floated by bedding the front and rear of the action for stability and to help maintain barrel to stock spacing for consistent accuracy. A recessed muzzle crown helps protect the rifling from damage. Barrels are triple checked for interior finish, straightness and air-gauged for uniformity. Inflex Technology Recoil Pad An all new Inflex Technology recoil pad is standard on every X-Bolt rifle. This ultra soft pad offers the best recoil absorption available on any rifle. The proprietary construction and material promote a directional deflection of recoil forces, pulling the stock comb away from your face to reduce felt recoil and muzzle climb. Magazine An all new detachable rotary magazine is incorporated into the X-Bolt. Constructed from a durable lightweight polymer, the magazine is designed to feed cartridges directly in-line with the bolt, instead of offset as with traditional leaf-spring magazines, for a straight shot right into the chamber. An ergonomic magazine-mounted release lets the magazine rotate directly downward and into your hand. The magazine sits flush with the bottom of the rifle for a sleeker appearance. Additional magazines can be kept loaded and carried in your pocket or pack for easy access.